There are several lists of plants which indicate that a woodland is ancient. However some seem to me to have species missing which are always quoted as indicators of ancient woodland and others include quite a lot of bryophytes which most people find difficult to identify. 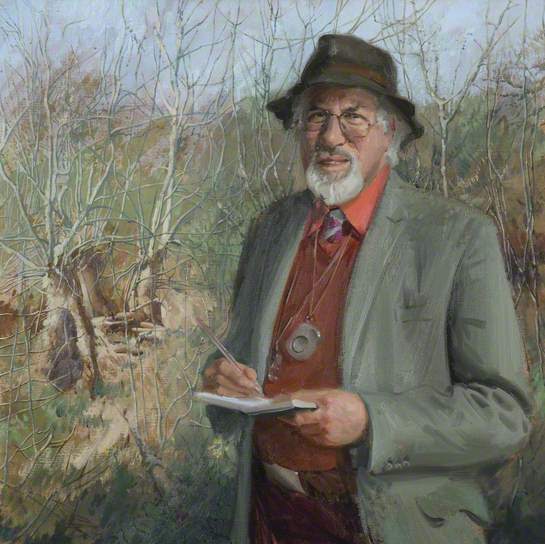 Painting of Professor Oliver Rackham in Corpus Christi Cambridge. So I referred to the acknowledged authority on woodland Oliver Rackham, (Professor of Historical Ecology; Cambridge) who has published many excellent books on woodlands. In his recent book ‘Woodlands’ he has published a list, which as he says is made up from 18 regional lists. He presents the list in the order of how many local lists a particular species appears on. So top of the list is the grass Wood Mellick, Mellica uniflora which scores 18 as it is the only species which was recorded on all 18 regional lists. Here is his composite list Common name first, Latin name next and the number out of 18 indicating how many regional lists it appears on. I have only represented species which score 4 or more. His list is longer and includes all species. If the common name is printed in blue then by clicking that name it will link through to a page dedicated to that species. The list continues with plants that only occur in 3 or 2 or 1 of the 18 lists that Oliver Rackham referred to but it gets quite long and less relevant. Surprisingly Bluebells comes in this final section, I would have thought it would have been much higher. Also no mention of Dog’s Mercury which I would have thought was a typical ancient woodland plant, maybe it regenerates too easily. In any particular wood only a certain number of the above species could possibly exist, because some species are restricted to alkaline soils and others will only live on acidic soils. Also some species are only found in the south so a northern woodland might be too cold to support certain species. As time goes by I will endeavour to link each species to an in-depth post on that specific species so that you can find out more about each species and check out if it is growing in your woodland or area. If the common name is printed in blue then by clicking that name it will link through to a page dedicated to that species.